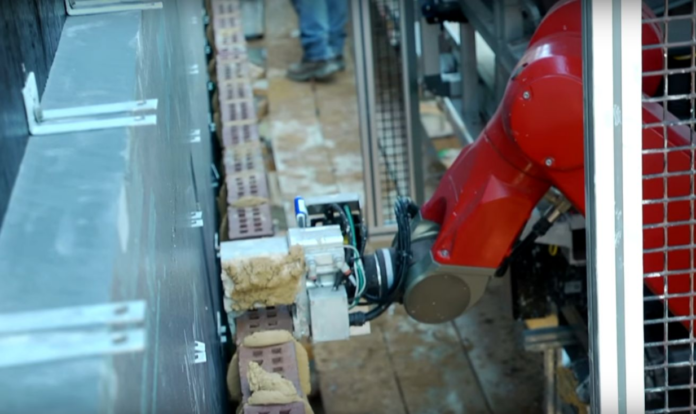 A construction technology company plans to bring its bricklaying robot to the UK this year in a move which could threaten jobs across the nation. Developed by Construction Robotics, SAM (Semi-Automated Mason) is a robot said to be capable of laying up to 3,000 bricks a day and is already being used on some building sites in the United States. “We are going to be going over to the UK in the coming months to meet with some companies and see if we can find a home for Sam there,” said Construction Robotics president Scott Peters when speaking to The Times. Despite providing a threat to bricklaying jobs, SAM does require heavy supervision with humans required to set up, supervise, and clean up excess mortar. But with the average human builder being capable of laying just 500 a day, it seems that there may be a place for SAM in the future – especially considering the skills crisis the British construction sector currently faces. At present, more than 400,000 UK construction workers are expected to retire between 2018 and 2023, with the building sector struggling to attract new talent. “We’re moving into the era of the robots,” proclaimed Alison Carnwath, the chairwoman of FTSE 100 construction company Land Securities, at last year’s Institute of Directors’ convention. According to The Times, SAM is currently available to rent in the US for the equivalent of £16,000. No rental fee has been revealed for British construction companies.